Attorney recommendation from Jeffrey Foster, bankruptcy attorney in Seattle, WA | Accused of a Washington State drug or VUCSA crime? "I have known Mr. Burg for three years now. 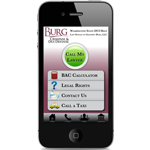 Mr. Burg is among the finest criminal defense attorneys I have ever come across. In addition to his superior knowledge and success rate, he is personable and a really great guy. A rare combination in the legal field. I strongly and unequivocally endorse this lawyer's work."